Dave Sweet of Narragansett used a Tony Accetta #14 chrome spoon with yellow feathers to catch this 33” striped bass off Narragansett. Dave said, “They mimic the sand eels pretty well”. 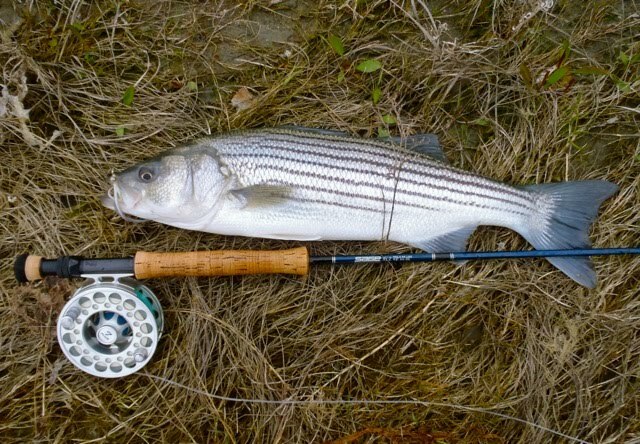 The reports are in… striped bass are all over Narragansett Bay and along southern coastal shores. 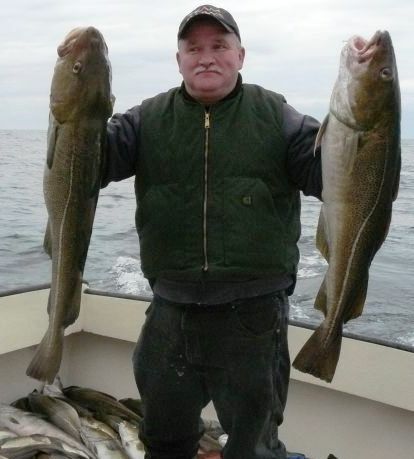 Ken Ferrara of Ray’s Bait & Tackle, Warwick said, “A customer caught a 38” fish off Hope Island and Jamestown this week.” Al Conti of Snug Harbor Marina said the bass are making their presence known at Block Island’s North Rip. Good reports of school bass with keepers mixed in all along the East Passage and even a good bite in Greenwich Bay (perhaps keeping the menhaden boats out of Greenwich Bay and the upper East Passage is working). With all this action why is it that some days, you just cannot get a bite… you scour waters trolling lures and tube & worm, cast in the shallows and around structure with soft plastics, hard plastics and surface poppers. You hit all your favorites spots, where you have caught fish and where others have caught fish… and still… no bass. Do not lose faith. It’s a matter of persistence, mixing it up, paying attention to water movement (tide and current) and yes trying to match what the bass are eating (or would like to eat). Thursday at 5 a.m. I said, “Today I’ll fish Greenwich Cove… catch school bass… as the fog and time I have to fish is limiting.” Captain Jim White of White Ghost Charters (noted author and Bay fishing expert) said, “You have to mix it up… present different baits to the striped bass until you find one that works.” In the past I would try to fish with one or two favorite lures with limited success. This morning I lined up seven lures all ready to go with fluorocarbon leaders. I had two surface poppers and swimming lures and three soft plastic baits. I tried all seven, found one that worked (a Yozuri Crystal Minnow) and caught six bass in 45 minutes. So mix it up to find out what works before you settle on a bait or fishing location. 1. Trolling with umbrella rigs. Technique often used to troll off Block Island and in deeper parts of Narragansett Bay, off coastal shores with a variety of squid, shad, and eel umbrella rigs. Hook two fish at the same time and you will experience a great fight. 2. Casting soft plastics, various bait types and weights to fish different depths. Many anglers love this technique and use it successfully in the spring. Make sure the plastic baits are scented if not add some scent. Who wants to eat plastic? 3. Buck tail jigs with pork rind squid strips. Have had success with this method to get under schools of blue fish and to the striped bass on the bottom. 4. Live eels. Used by shore and boat anglers, some fishing guides use this as their primary method to catch killer stripers. Hook the eel through the mouth and out one eye. 5. Live menhaden. Snag the live bait with a weighted treble hook or net them. Hook the bait through the bridge of the nose, find a pod of fish and put the live menhaden into the pod. Used when menhaden are running strong, particularly up the Providence River in early spring. The West Bay Anglers will hold their 2011 William Beaudry Jr. Memorial Striper Tournament from June 4, 12:01 a.m. thru June 12, 1:00 p.m. First place prize for largest fish is $500 with 2nd and 3rd place cash prices too. Prizes awarded at the Warwick FOP at 1 p.m., June 12. Rules and applications online at http://www.westbayanglers.org/ or at local bait & tackle shops including Ericson’s, Johns Bait , Lucky’s, Ray’s Bait & Tackle and the Tackle Box. Entry fee is $25, open to all anglers, must register by 5 p.m., June 3rd. The RI Lions Sight Foundation will host its 4th annual fishing tournament for Visually Impaired Persons(VIP) of Rhode Island. The half-day tournament will be held on a Francis Fleet party boat out of Galilee RI where the participants will be competing for one of several trophies and; for an opportunity to represent Rhode Island at the Lions National VIP Tourney on the Outer Banks of North Carolina in October. Applications for the tournament and on the Lions can be found at http://www.lions4sight.org/index.htm and http://www.rilions.com/ or contact Ken Barthelemy (kenbar123@aol.com) at 401-529-6173. Tautog fishing in the Bay north of Hope Island in the West Passage and in Mount Hope Bay and north all the way up the East Passage to Providence has been outstanding. Hannah Mellion of Farm Fresh Rhode Island talks about their fresh fish pilot project at the RI Senate Special Task Force on Fisheries chaired by Senator Sosnowski. How would you like to buy fresh Rhode Island cod, striped bass or flounder for dinner tonight and know where and when it was caught and a little something about the captain and crew that caught it? This is what the Local Catch Pilot project of Farm Fresh Rhode Island and Local Catch, Inc. is doing. They aim to bring fresh local fish to market at competitive prices. Hannah Mellion of Farm Fresh Rhode Island said, “We are applying the same model we used to successfully bring fresh RI produce to restaurants, farmer markets and supermarkets and are applying it to fresh fish caught in Rhode Island.” Efforts to bring fresh RI fish to market were outlined last week by Local Catch, Inc. and Farm Fresh RI at the Special RI Senate Task Force on Fisheries chaired by Senator V. Susan Sosnowski (D-South Kingstown and New Shoreham). Larry Mouradjian and Ken Ayers of the Department of Environmental Management also spoke. Ken was responsible for helping to start the “RI Fresh” movement and said his department has set aside $20,000 in grant money to start a RI Seafood Marketing Collaborative whose purpose will be to market fresh Rhode Island fish. Another speaker a last week’s hearing was Eric Reid from Deep Sea Fish of Rhode Island, a RI seafood wholesaler, who said stable markets are needed to bring fresh RI fish to market, “We can’t have derby fishing.” Relating to the way fisheries are often managed by dictating that they must only fish on a limited number of days taking away their flexibility and ability to bring fish to market in a consistent, reliable manner (see below story on successful fisheries sector management techniques). Branding Rhode Island fish as fresh, wholesome, nutritious and reasonably priced is something that I think is a great idea. Branding RI fish in this manner will help recreational fishing in RI as well as commercial fishing. Under a new fisheries management program effective since last May, revenues increased for the Northeast groundfishery during the first nine months of the 2010 fishing year compared to same period in 2009. Higher average prices for all species accounted for the increased revenues. These are among the findings in an interim report released by NOAA’s Northeast Fisheries Science Center. Researchers looked at gross revenues, fishing effort, average vessel performance, distribution of revenues, and employment for the first nine months of the 2007 through 2010 fishing years. Among the new trends are increased revenues and prices. Revenues from all species on all trips by groundfish vessels in the first nine months of 2010 were up about $24 million over the same period in 2009. New England groundfish management measures which took effect in 2010 include annual catch limits to prevent overfishing and rebuild overfished stocks and two options for controlling fishing effort. Fishermen can either form groups and fish an allotted share of the total allowed catch (like the RI Fluke Sector Pilot mentioned below) or fish individually with a limit on the number of days spent fishing. Another successful example of “Sector” management is the commercial RI Fluke Sector Pilot which is now in its third year. Since its inception this Pilot Fluke Sector has grown, new members have been added as fishermen saw the benefits of flexibility… being able to fish when other species were not available or when market demand is highest. The sector has proven to be a very effective way to sustain the resource as well with record low discard rates compared to the days a sea method. The Federal Government mandated that all coastal states have a registry (or license program) that supplied contact information on all saltwater anglers for surveys and data collection to obtain more accurate fishery data to manage better. The Rhode Island Saltwater Anglers Association (RISAA) worked with DEM to write the Saltwater Fishing License law we presently have. Funds raised by the license will go into a separate fund that must be used to enhance the fishery. It does not go into the general fund. The Federal Government will use the data collected by the State to study recreational fishing. Last week Gary Leatherberry, an avid angler and associate at Erickson’s Bait & Tackle, Warwick, said during a NBC Channel 10 interview that he supported the existing State license law, saw the need for data collection to better manage and had faith that the funds collected would be properly used. This is a view shared by many anglers including RISAA, an organization that represents over 6,000 recreational anglers in Rhode Island. The State of RI is in tough fiscal condition. Funds to implement a state registry with no fee would likely make the situation worse. Fluke. Bruce an associate at Breachway Bait & Tackle in Charlestown said customers have been catching small fluke with some keepers off southern coastal beaches. Similar reports from Francis Fleet vessels. Peter Nilsen of Barrington, RI and a member of the Rhody Fly Rodders caught this 24” school striped bass on a chartreuse and white Clouser streamer in the Narrow River in Narragansett last week. Lary Norin of Cumberland, Rhode Island with the 10 pound, 25” tautog he caught along Narragansett, RI’s rocky coast. Lary caught the fish in 30’ of water while using green crabs as bait. The tautog bite improved a great deal this week with some big fish in the nine and ten pound range being caught (see “Where’s the bite” below). When fishing alongside a bulkhead or pier, barnacles and growth attached to the structure can serve as a great natural chum bait. Take an oar and scrape the structure allowing barnacles to fall in the water below serving as natural chum bait. I like to use a mixture of crab legs and sea clams cut up into small pieces. One of the most useful tips for getting the chum where you want it appeared on the Rhode Island Saltwater Anglers Association (RISAA) blog last year. Place chum in a small paper bag with a heavy rock inside at the bottom of the bag, secure the top of the bag with a line and place the bag in the water where you want the chum. The bag sinks to the bottom, wait a minute or two, the paper bag gets soaked, yank on the line a couple of times… the rock breaks through the bag and the chum lands under the vessel where you want it rather than having strong currents taking it away from the boat before it reaches the bottom. The Rhode Island Marine Fisheries Council (RIMFC) met last week to address the black sea bass fishery which has been designated as an overfished species. The council voted to recommend to DEM director Janet Coit a daily black sea bass limit of fifteen fish with a minimum size of thirteen inches and a season of July 11 to December 31. DEM’s preferred option was ten fish so the director may override the council’s recommendation. The council also recommended a proposal to require a saltwater fishing license when fishing for squid. Steve Medeiros, president of the Rhode Island Saltwater Anglers Association, said the topic brought much discussion at the council meeting, “…if squid was exempt, anyone out fishing without a license, who didn’t have a fish in the bucket yet, would just say they were fishing for squid.” The council also recommended that anglers should not be required to carry a photo ID in addition to a salt water license. Medeiros continued to say that the council recommended that shore-based spear fishermen had to have a license available “within a nearby car or other locations that is within in a five minute walk from the point of exit from the water”. Director Janet Coit is expected to consider RIMFC recommendations and rule on regulations this month. Last week two bills hit the RI Senate floor pertaining to fishing. Bill 2011-S 850 titled “Senate Resolution Respectfully Urging Congress to Support the Marketing of Rhode Island Seafood” and bill 2011-S 846 titled “Senate Resolution Respectfully Urging the Rhode Eland Congressional Delegation to Give Rhode Island Representation on the Mid-Atlantic Fisheries Council.” Both bills were recommended by the Environment & Agriculture committee chaired by Senator Susan Sosnowski. This Wednesday the Special Marine Fisheries Task Force chaired by Senator Sosnowski was held in the Senate Lounge. 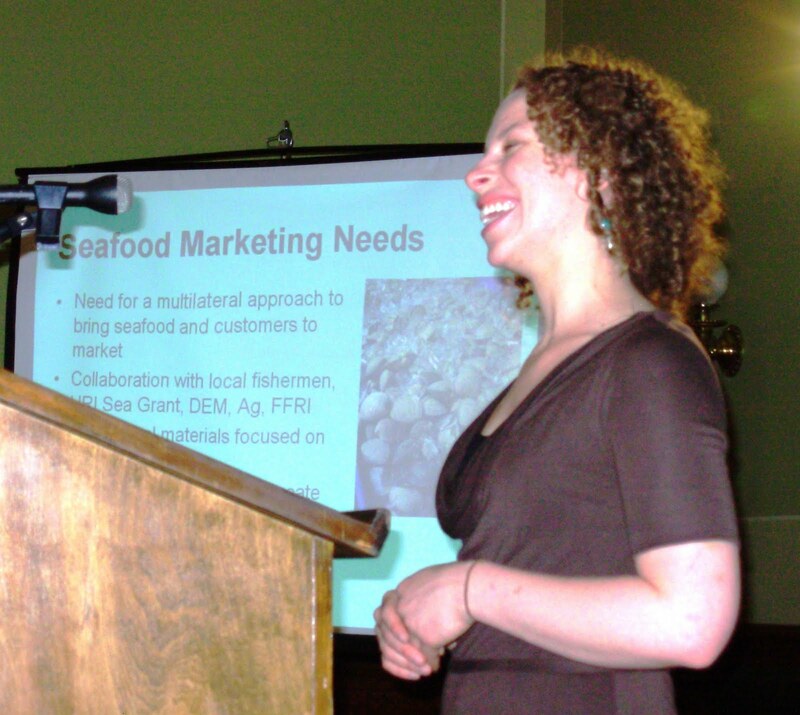 The topic discussed was the establishment of a Rhode Island Seafood Marketing Collaborative. This is a good next step to brand and market Rhode Island fish to consumers in and out of the State of Rhode Island. The port of Galilee in Narragansett, Rhode Island is undergoing an economic development assessment May 9 through May 11, 2011 by the Economic Development Administration (EDA) and other federal agencies. The assessment team will hold meetings with local leaders to help identify economic development challenges and opportunities facing local fishing industries and communities. The goal of the visit is to provide customized technical assistance to the region, which has experienced reductions in ground fish fishing revenues in recent years. After the assessment, the EDA will present a report that captures economic development best practices and customized strategies for the region’s long-term strategic economic development. Narragansett is one of six fishing communities in the Northeast selected to participate in the economic development assessment project. The other communities are Portland, ME; Seabrook, NH; New Bedford, MA; Gloucester, MA; and Montauk, NY. Tautog fishing improved a great deal this week. I received reports of good sized tautog being caught in the lower, mid and upper bay regions. Lary Norin of Cumberland caught a number of tautog including a 25”, 10 pound tautog when fishing along the rocky Narragansett coastline. The big tautog (and two 23” cod) were caught in about 30 feet of water using green crabs. 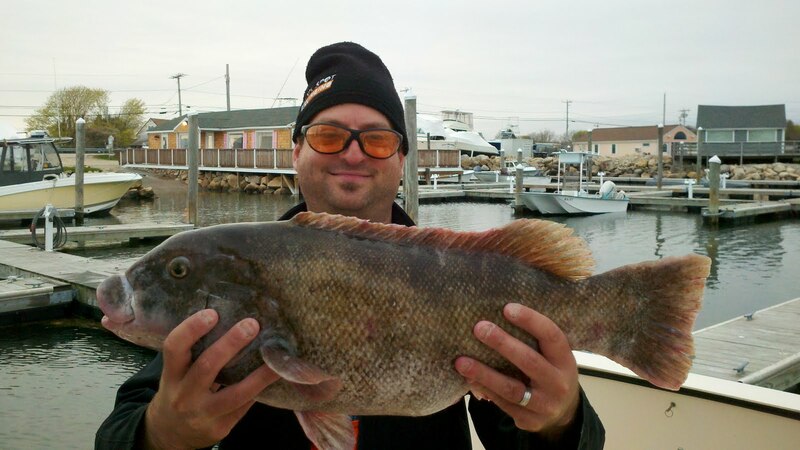 Chris Catucci of Warwick landed a 9 pound tautog using green crabs while fishing off a dock in Warwick Neck. Reports of tautog being caught off Hope Island, General Rock in North Kingstown, and at the Bullocks Point concrete marker in Barrington. Striped bass fishing continues to improve with school bass being caught in Greenwich Bay, the East Passage of Narragansett Bay and along the Rhode Island coastal shores. Fish are spotty but they are here. No reports of big fish being caught yet. Chris Catucci reports catching school bass off Rocky Pont. Chris said, “School striped bass are in. I caught a 20 inch bass on my first cast with a Yozuri.” Dave Sweet reports catching twelve school striped bass in the Narrow River, “...tagged and released 12 school stripers for the ALS, all about 14" long. I'm sure they were all winter hold-overs, no sea lice present. Fishing in 3-10 feet of water, low to slack low tide in the upper river. 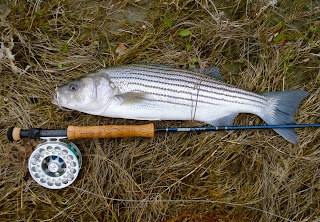 All fish caught on either a 3" Storm shad, a chrome Tony Acceta #14 spoon with yellow teaser feather, or a Cocahoe minnow.” Sunday night, I caught my first striped bass in Greenwich Bay and, believe it or not, my first bluefish of the season. 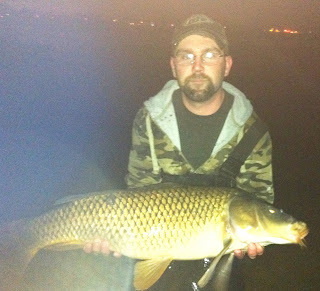 Henry Fisette of Coventry caught this catfish and a 19.13 pound carp last week at Lake Tiogue, Coventry. Matt Mull (bottom) of Saunderstown, RI and Mike Casey of Danbury, CT caught these 20 pound cod fish last weekend while aboard the charter boat Drifter (Capt. Rich Chatowsky) out of Snug Harbor, RI. 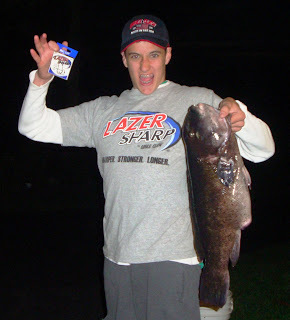 The Tautog bite improved last weekend in the east Bay and Mt. Hope Bay and heated up in the west Bay this week. I fished the jetty at Coddington Cove in Middletown Saturday and caught one keeper and two smalls on an outgoing tide. This Tuesday Ken Landry of Ray’s Bait & Tackle, Warwick, said, “The tautog are in. We fished Hope Island and caught six nice fish in one and a half hours. The largest was seven pounds.” Dave Henault, of Ocean State Tackle, Providence, reports anglers catching big tautog in the east Bay… a seven pound tautog caught in the Barrington River at the bridge and a nine pound tautog caught on the Warren River. Tautog bite will improve for the spring so get ready. Here are six tips to keep in mind. 2. Fish where the fish are. This is particularly true with tautog because they are a territorial species, you have to find the tautog, they are not going to find you. So if you get no bites, move to another spot. 3. Green crabs are the bait of choice in the fall, however, in the spring clam worms and clams work well as the tautog seem to like soft baits. When using crabs make it easy for the tautog to bite and take the bait. Break off claws and legs, cut the crab in half and hook it through one leg socket and out another. 4. Feel the bite… tap, tap and then get ready for a tug of war. Captain George Cioe said, “I believe with the first tap the tautog is positioning the bait for consumption.” On the second or third tap I raise the rod up firmly feeling the weight of the fish (no need to jerk the rod up hard). Once the fish is hooked, keep the rod up and pressure on so the fish in not able to run for cover. 5. Use braid line with little drag. Braid line allows you to feel the fish tap. Monofilament line will stretch allowing the fish to run for cover. 6. Where to fish for Tautog. From shore look for rocky coastline like Beavertail Point on Jamestown, locations off Newport and off breakwater rock walls at South County beaches. From a boat, I have had good luck at Plum Point light house next to the Jamestown Bridge, the rock wall north of Coddington Cove in Portsmouth, off Hope Island, around Brenton Reef in Newport, Whale Rock, Ohio Ledge in the East Passage and any other place there is structure, debris, rock clusters, wrecks, etc. The RI Bays, Rivers, and Watersheds Coordination Team (BRWCT) last week released an assessment of development opportunities for Rhode Island’s three major port areas, Providence, Davisville and Newport. The purpose of the report is to provide a review of Rhode Island’s existing port infrastructure, the marine cargo market of the U.S. Atlantic seaboard, and, based upon those analyses, recommend port investments with the greatest potential to bolster job creation and grow the State’s maritime economy. The report confirms that the auto imports/exports sector, which has made substantial gains at the Port of Davisville, as well as ProvPort, has continued growth potential. It identifies growth opportunities in break bulk imports (perishables). It cautions that the scale and timing of the expansion of port facilities to support offshore wind facility development depend primarily upon successful power purchase agreements being struck between wind farm developers and electric utilities. Finally, it reviews the challenges to developing infrastructure in the Newport Harbor area that could inspire growth in cruise ship visits to Newport. An executive summary of the full report is available for download from the BRWCT website: http://www.coordinationteam.ri.gov/. The Department of Environmental Management announces that Saturday, May 7 and Sunday, May 8 are free fishing days in Rhode Island. During those two days, all Rhode Islanders and visitors can fish in freshwaters without a fishing license or trout conservation stamp. Anglers will have an opportunity to catch a prized Golden Rainbow trout on Saturday, May 7 during a fishing tournament sponsored by DEM’s Division of Fish & Wildlife at Little Round Top and Big Round Top Ponds in Burrillville. DEM’s hatchery staff will stock the Rhode Island hatchery-raised Golden Rainbow trout at these two fishing access areas for the event, and prizes will be awarded to the lucky anglers who catch a Golden Rainbow. There will also be loaner fishing rods and bait available. Eric Schwab, National Oceanic and Atmospheric Administration’s (NOAA) assistant administrator for fisheries was in Rhode Island last week to review a recent study conducted on inter agency/council cooperation between groups studying and managing fisheries in the Northeast. Groups studied included the NE Fisheries Management Council (NEFMC), the Northeast Fisheries Science Center (NEFSC) and NOAA’s Northeast Regional Office (NER). The idea of the study was to identify ways the groups can work together more efficiently, effectively with cooperation as a priority. Fresh water bite is very strong. Last week Henry Fisette of Coventry, RI caught a 19.13 pound carp in Lake Tiogue, Coventry using his home made chick pea scented bait. He followed this with a 9 pound cat fish and several trout he caught in the Pawtucket River in Coventry. Chris Catucci of Warwick found Lake Tiogue hot for bass fishing using jigs slowly retrieved or dead sticking a Senko. Chris’s gear included Eagle Claw Hooks a Wright and McGill fishing rod. Tautog bite improved this week as mentioned above. Scott Bianco reports catching three keepers with little effort in Mt. Hope Bay. Striped bass bite is on. 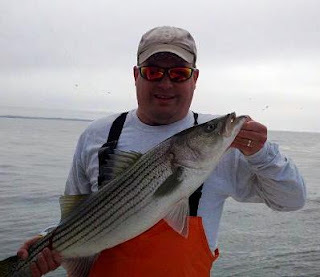 Anglers along coastal shores in RI report catching striped bass with keepers mixed in with school bass. Reports on the RISAA blog of anglers in Saunderstown catching keeper stripers on clam works as they fished for tautog. Cod fishing was great this weekend off RI. 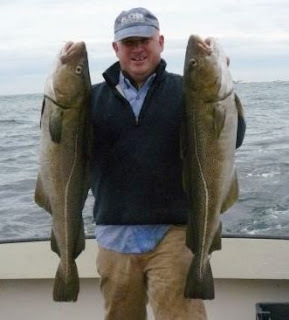 Matt Mull of Jamestown, RI reports catching a boatload of Cod at the Southeast Fishing Grounds on the charter boat Drifter (Capt. Rich Chatowsky) out of Snug Harbor, RI Saturday. 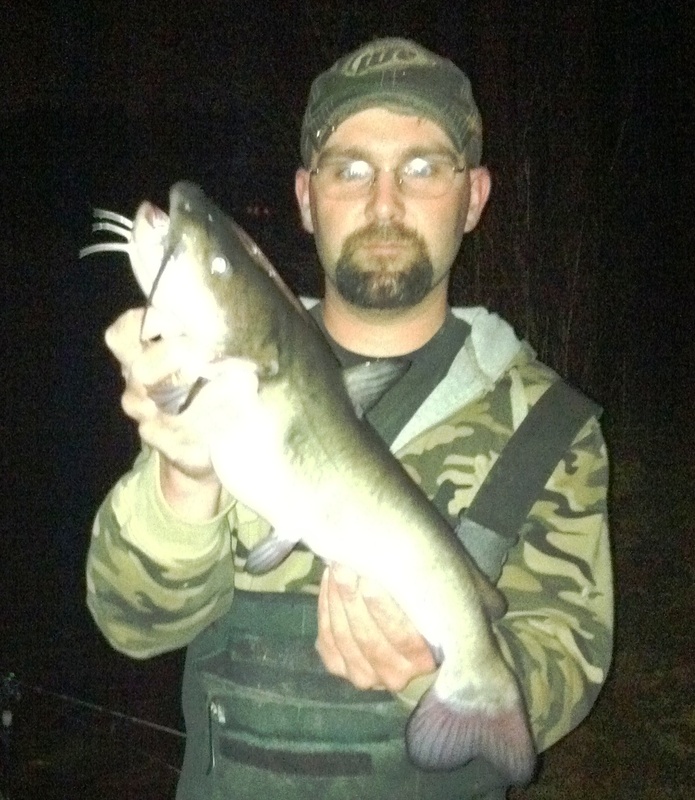 After a couple of hours of fishing he, his friend Mike Casey from Danbury, CT and the rest of the party limited out. A dozen fish over 20 pounds were caught with very few throw backs.